What Should You Really Feed Your Cat? One reason that cats like dry food so much is because the pet food companies spray the kibble with liquified animal entrails which are very pleasing to a cat’s sense of taste and smell - making a terrible diet very desirable to your cat. This site suggests some excellent ways of transitioning your cat if your cat doesn’t take to wet food right away. 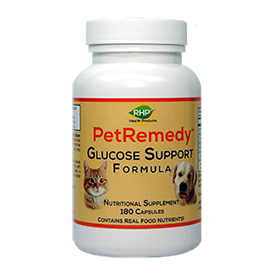 Order the RHP® PetRemedy™ Glucose Support Formula below and you will see the results in your cat!